On our website you buy art from street artists which they've made especially for Streetart.com. We always keep our special sales on the same day and time: Wednesday 09:00PM CET. Would you like to know when we have a new sale? Sign up for our newsletter. Is there no special sale, or are these works already sold out? Check our shop for available works. In addition to selling, we also supply various street art services. Murals, 3D streetpainting, events, expos. Anything is possible. See our projects page for more information or contact us. Silkscreen on white, gold or chrome paper (300gms). Limited edition of three times 15 prints. Cut Up is derived from a large mural that Bustart created at Teufelsberg Berlin. The iconic figures Felix the cat, Mickey Mouse, Garfield and a Smurf are fused into one new character. 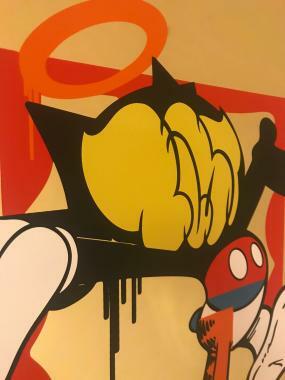 The face consists of the graffiti letters ' Bust ' and around the figure, there is a red frame that refers to the classical labels/stickers used by graffiti writers. With this work Bustart created a very nice combination between graffiti, cartoons and our pop-culture. 'Graffitipop' as the artist himself calls his style.